Chip is married to Brenda Hable, practice manager and love of his life. They have two children, Eric and Heather, and one grandson, Kailer. 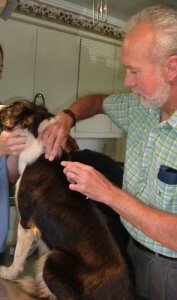 Chip began his veterinary career in Sunbury, Pennsylvania in a busy five veterinarian mixed animal practice, working with dairy cows and carriage horses on Amish farms, as well as with dogs and cats. In 1987, Chip and his family moved to an island off the coast of Georgetown, South Carolina to assist field research efforts in immunization of wildlife against rabies with the Winstar Institute in Philadelphia, Pennsylvania and the University of Georgia’s Cooperative Wildlife Disease Group. Chip and Brenda returned to Pennsylvania in 1989 and practiced in a primarily small animal and equine practice in Redhill, PA. In 1990, they moved to Patrick County and purchased the Animal Clinic from Dr. Nelson Witt, who was retiring after more than forty years of veterinary services to Patrick County and the surrounding area. Dr. Hable has special interests in dermatology, ortopedics, and emergency medicine. In his spare time, Chip enjoys hunting, fishing, and spending time with his family.